Following the sad murder of a Nigerian musician and her child by the Italian husband, the police has arrested the man. 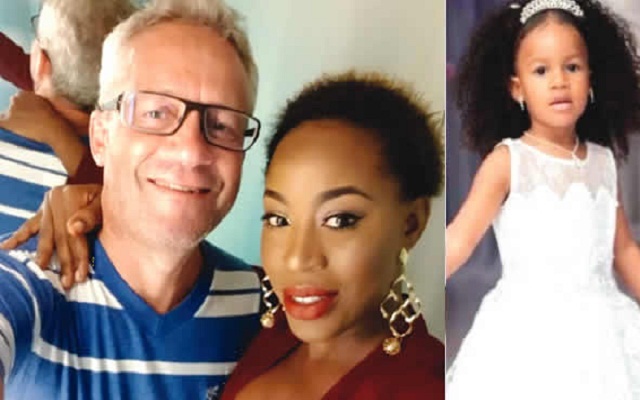 An Italian, Peter Nielsen has been arrested for allegedly murdering his Nigerian wife, Ali Zainab Nielsen aka Alizee and their four-year-old daughter, Petra Nielsen. Alizee, was a singer before she was reportedly murdered by her husband yesterday. Reacting to the incident, Lagos State Police Public Relations Officer, SP Chike Oti, confirmed Peter Nielsen’s arrest, adding that crime scene investigators have been deployed to the scene. Oti said: “The state Commissioner of Police, Edgal Imohimi, has ordered the arrest of the suspect and he is in police custody. It is pre-emptive now to ascertain the cause of the incident. It was gathered that Ali Zainab Nielsen aka Alizee and her daughter, Petra Neilsen were murdered yesterday morning 5th April, 2018 allegedly by her Italian husband, Peter Neilsen.